YOU CAN’T MAKE THIS STUFF UP! Glassworks Improv at 2013’s fest. Two years ago I wrote a feature story in this magazine about Eau Claire’s burgeoning improv scene, and at the time, it was just that. Burgeoning. There were a couple of teams here and there. Eau Claire Memorial High School’s student teams found huge local audiences. 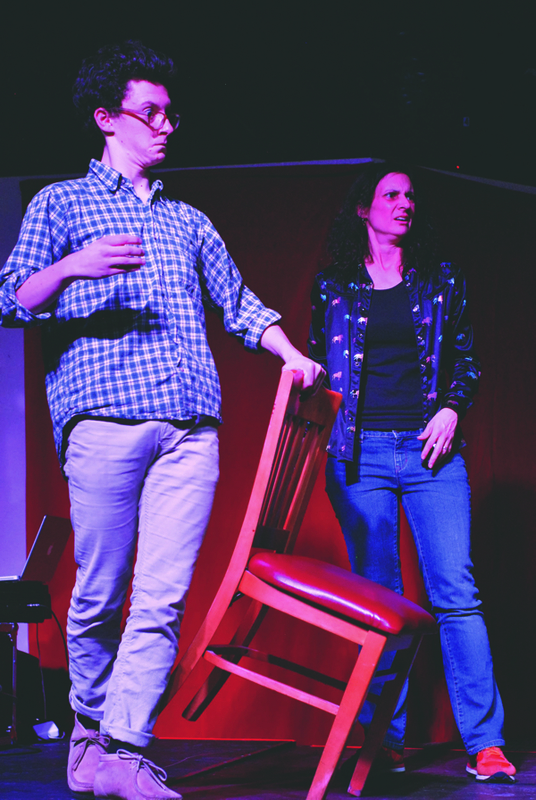 The BareBones Improv Lab, a rotating smattering of community improvisers, would throw pretty successful shows every now and then. The Backwards Thinkers Society, UW-Eau Claire’s student short-form team, would perform around, developing their own skills. And there was really no fully suitable venue to do so. It’s not 100 percent the work of the Eau Claire Improv Festival – an annual multi-day event across the entire community, bringing together our Chippewa Valley-grown teams as well as pulling big name improvisers and teams from across the country – but it’s close. 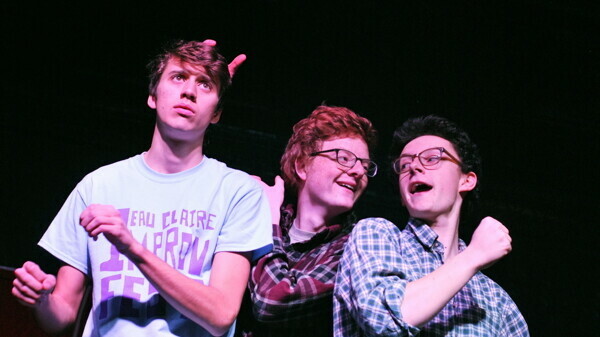 Organized by the Eau Claire Memorial High School improv coach, Amber Dernbach (a supremely skilled improviser in her own right), Improv Fest is now in its third year, satisfying the tall task of growing and evolving every year it rolls around. The first year of Improv Fest in 2012 was largely made up of local players and teams. The second year, they went national and hired a guest artist. Now, in their third year, they’ve expanded to three separate showcases (one at Memorial and two at The Plus) featuring tons of local and national improvisers, and have two hired guest artists, all the while providing workshops and learning opportunities all over town so wannabe improvisers with lots, little, or no experience can develop their skills. Mack Hastings, of Glassworks, said this year’s festival is one to be pumped up about. The festival spans two and a half days, kicking off Dec. 11 at the Volume One Gallery, and brings those improvisers all over town with performances at Memorial and The Plus. With so many national improvisers, the festival organized an ambassadorship program – a popular action taken by festivals, especially in improv – where every traveling team gets an Eau Claire ambassador (which is usually one of the local improvisers) to show them around town, and be in contact with prior to the start of the festival. This is so that teams come to town and immediately feel a part of it, both the festival and the community. “We’re trying to get people to feel that Eau Claire welcome,” Hastings said. And with a festival so huge about to launch, a new marketing partnership with Visit Eau Claire under their belt, and an ever-growing scene fit to blossom, planning for next year is already underway. The idea is simple, really: Provide an opportunity for improvisers to grow (by watching professional improvisers, getting to know each other, or taking workshops) and they will. For more info on the Eau Claire Improv Festival, a complete schedule of performances, performer biographies, ticket information, and more, check out ecimprovfest.com.